Bury has a strong tradition in the MABL, entering the league back in 1991 as the Bury Grammar School Old Boys (BGSOB). Over the years players were recruited and it wasn't until 2002/3 when they captured their first league title, following this up with three more wins in 2003/4, 2004/5 2005/6 winning the title four consecutive times and winning the playoffs twice, forming rivalries with Stockport, Moss Side and Preston. During this time Bury had a team in the premier and division two, a reminder of the talent around in Bury. The Premier league squad included players such as Brad Watmaugh, Stuart Jackson, Stephen Graham, Dave Kingsley and Mike Nichols, the latter now plays and coaches the reincarnation team, the Bury Blue Devils. A special mention goes to Robert Finlayson who at the age of...well he is older than 50, has been around since the beginning and still has a deadly jump shot and still puts some youngsters to shame. The Blue Devils decided to go National league in 2007/8 and continued to compete in the MABL premier league, withdrawing their second team from MABL division two to allow a balanced squad for both teams. They competed Nationally until the 2010/11 season when the team had to fold due to financial difficulties, a factor that ultimately takes so many other teams away from National league competition. 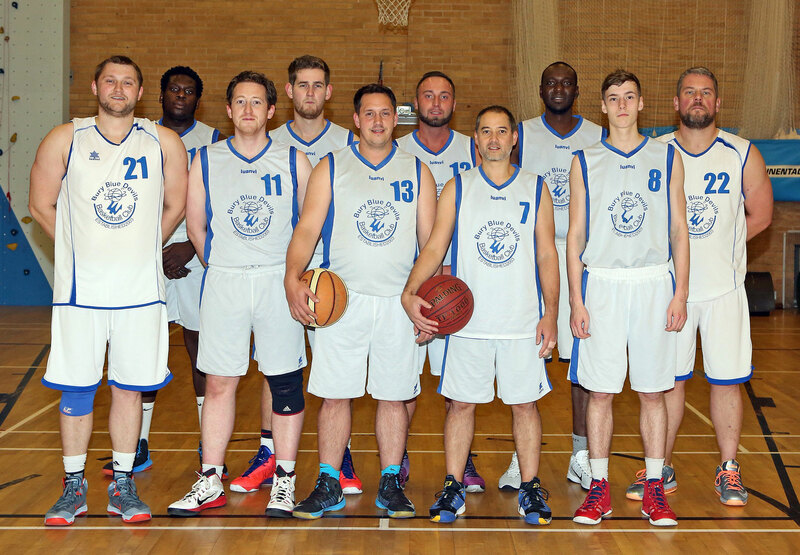 The Bury Blue Devils entered the MABL league in the 2011/12 season in Division 2 and were promoted after winning the division and competed in div 1 for the 2012/13 season. They were up for promotion, finishing a respectable second but a restructure will see them compete in this year's Championship division. Throughout the years the team has always competed at Bury Grammar school for boys and it was only last season that shower heads were installed in the changing rooms after eight years! Ah the rewards of competing in the MABL! The 13/14 season was one of medioracy for the Blue Devils, finishing the season with a semi final loss in the playoffs to eventual winners Chorlton but finishing third in the division. Bury made personnel changes with players such as Graham Greene wanting to play at a higher level. He was "lost" to National league division four team Lancashire Spinners. We wish him the best. Mike Nichols continues to play and coach with Bob Finlayson doing a sterling job as secretary, something he's been doing since the formation of the club. The 14/15 season saw the Blue Devils sharing home court with Division one side Mavericks who had lost their home court. This arrangement works well because some of the Mavericks have come through the Bury Junior system so players such as Ajaz Wadood get to "come home". Psychologically the Mavericks get to practice against better players that aids improved play and confidence while Bury benefit from competing against a team at training every week and again can only aid improvements. The two teams share costs of court hire which again is a bonus.